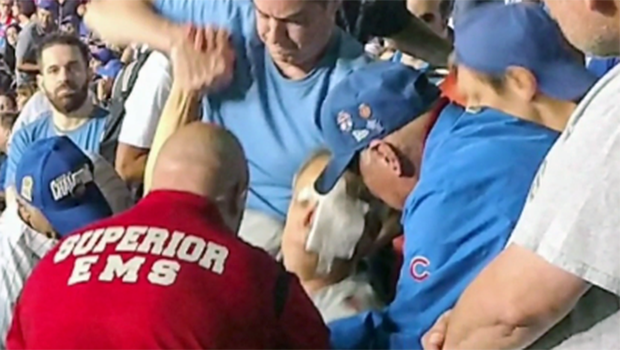 SCHAUMBURG, Ill. -- A Cubs fan is at risk of going completely blind after being hit by a foul ball during a game in August, CBS Chicago reports. Jay Loos, a 60-year-old father from Schaumburg, Illinois, was sitting along the first base line at Wrigley Field with his two sons and daughter when a Pittsburgh Pirates batter slammed a foul ball into his face. He suffered broken facial bones around his left eye and a broken nose. "It was excruciating pain," Loos said. He's had three surgeries since the incident and can't see out of the injured eye. Doctors now worry that about a rare syndrome that could cause him to lose his vision entirely. "Every day, every morning I wake up, I'm going to be worrying about this 'sympathetic eye syndrome,' and did I just see my last sunset?" he said. Loos says a lack of complete protective netting at Wrigley Field and other major-league ballparks puts fans in danger, especially around the dugouts. Just weeks after he was hit, a girl was struck in the face by a foul ball at Yankee Stadium. She reportedly suffered facial fractures, vision damage and bleeding on the brain. A young boy was hit by a bat in New York in May. Reports show as many as 1,700 fans get injured at ball parks every year. Loos's daughter, Emma, had stepped away from her seat and returned to find her father covered in blood. "The only thing I could think of was, 'I can't lose my dad, too.' I lost my mom eight years ago, and that's my biggest fear is losing my dad, too," Emma said. The danger is not just at baseball stadiums. Three years ago, CBS Chicago reported on Chicago Blackhawks fan Chip Green from Yorkville, Illinois. He was hit in the head by a hockey puck and suffered brain damage. Green is suing the NHL. Loos, meanwhile, has hired attorney Colin Dunn from Clifford Law Offices. He wants Major League Baseball to expand netting past the dugouts to protect anyone in what he calls a "hot zone," where a foul ball can strike at incredible speed. Loos faces at least one more surgery and continues to worry over how much vision loss he will suffer. Dunn, who also represents Green, says he is planning to file suit. In a statement, the Cubs said, "Fan safety is paramount to the gameday experience at Wrigley Field. We will continue to work with Major League Baseball to explore ways to ensure our fans enjoy baseball in the safest possible environment." According to the MLB, 10 baseball clubs have netting that goes past the dugouts. Netting decisions are made by each team, not the league. Earlier this month, the Yankees said the team plans to expand protective netting at its home ballpark and spring training complex next year.